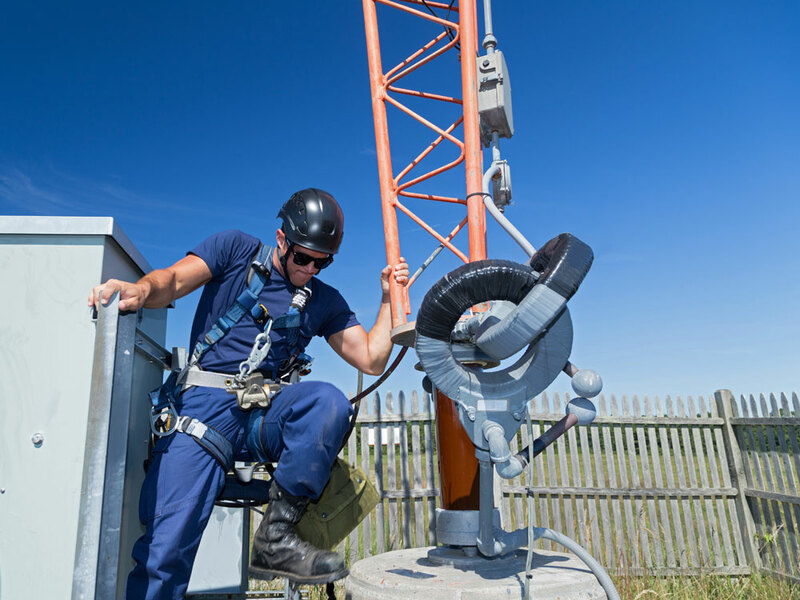 Climbing telecommunications towers although may look as simple as climbing a ladder with definite looking rungs, however, it is such an action which requires extreme care, alertness, training, somewhat experience and most of all knowledge. If your checklist ticks all of the aforementioned factors then you are ready to climb a telecom tower. The sole reason for such care is the rise in the fatality percentage over the past year or so. Tower falls have caused about 11,000 deaths worldwide. The spreader snap helps in relieving the pressure from the waist and hips while up on the tower. It has double locks on both sides for secure connection. Fall arresters are an important component in the body harness which helps in clinging to the tower while working. Carabiners are extremely necessary for lifting and rigging applications. You can maintain fall protection while climbing or traversing structures with a Bypass Lanyard. One snap hook remains secure, while the second is moved to the next step. You can even see mountaineers using it. The full body harness is specially designed to aid the worker during the job as well as take care of his safety. It has suspension loops, D-rings at the front, webbing and provides a shielded safety along with aiding the mobility. Anchor straps securely connect the body to the tower just like when a ship is safely anchored at bay. The rope grab automatically follows you, giving you maximum freedom and hands-free operation; it also includes a manual option that allows you to fix the rope grab in place making it ideal for restraint or work positioning applications. It can be detached or removed anywhere along the lifeline. The rope grab utilizes a cam lever brake to lock the rope grab onto the lifeline in case of a fall. It should contain everything necessary for a fallen tower climber i.e. bandages, tablets, injections etc. Roper termination plate helps in avoiding knotting the rope and increasing the safety overall. Tower climbing safety would look very simple indeed but it is defined by safety procedures which are necessary to be taken care of. Such procedures include government defined regulations, safety harnessing and lastly, getting a training before doing any such activity. It is necessary to wear the full body harness for everyone along with a helmet that protects the head from a cranial injury. Gloves are also important and they ought to be water and shock resistant as well as having a great grip. The same goes for the shoes. Safety goggles help in getting a great view and avoiding a fall. First of all the medical examination is necessary for everyone in the tower climbing arena. In addition to that, the worker should know how to handle medical emergencies and also a CPR. Before any climbing, there should be a plan worked out covering all the contingencies. It should contain all necessary procedures about climbing, anchorage and regarding medical emergencies too. All the potential hazards that could happen while climbing such as earthquake, snow, birds, high winds, and electric shock should be kept in mind. The harness should be double and triple checked by the wearer. All the equipment should be in place. Tower Climbing Safety Training is MANDATORY for individuals utilizing Fall Arresting devices. This training instructs on the proper selection and use of an anchorage point, securely hooking up the equipment, and safely moving from one area to the next.